Colombian National Army prepares to patrol the mountains where rifle and mortar has been fired by FARC in combats near El Palo. Cauca, Colombia. 2012. An army soldier cleans his gun and sharpens his machete in a road in Cauca, Colombia. 2012. Soldiers from the National army and a Police member stand guard in one of the streets of Toribio, after tensions grew hi between indigenous Nasa groups and military personal in Cerro Berlin Base in the outside of the town. Toribio. Cauca, Colombia. 2012. A woman walks by his house that was targeted allegedely by rounds fired by the National Police in El Palo, Cauca. 2012. Chivas are seen in the central market of Toribio, Cauca. Colombia 2012. A Nasa man is seen in Toribio, where the CRIC (for the acronyms in Spanish for Regional Counsel of Cauca), an organization that encircles a large majority of the Nasa community in Cauca with objectives to continue building the cultural heritage of the Nasas and for imposing indigenous law as granted by the Colombian constitution. Toribio, Cauca. Colombia. 2012. "Chivas" buses transport goods and peoples between towns in northern Cauca, Colombia. 2012. 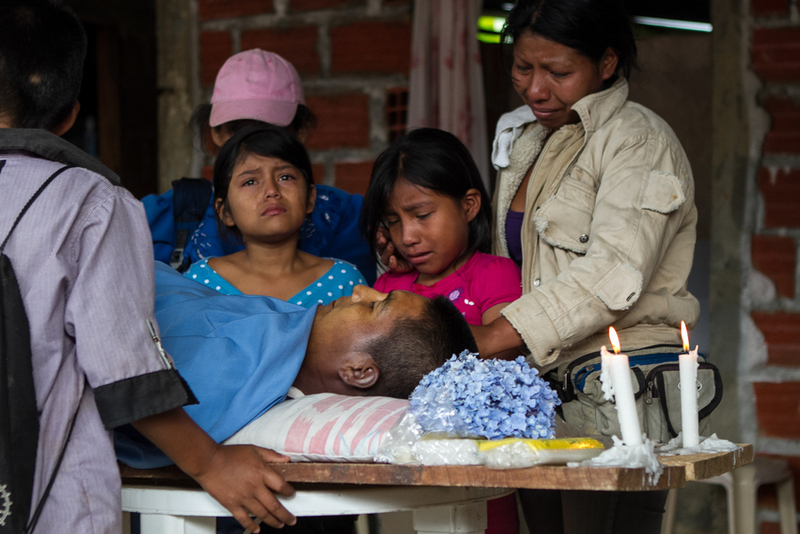 A member of the community of el Palo, hold the caskets of rifle rounds, they allege this were fired by elements of the National Army against them in a protest that cost the life of 2 farmers. Cauca, Colombia. 2012. 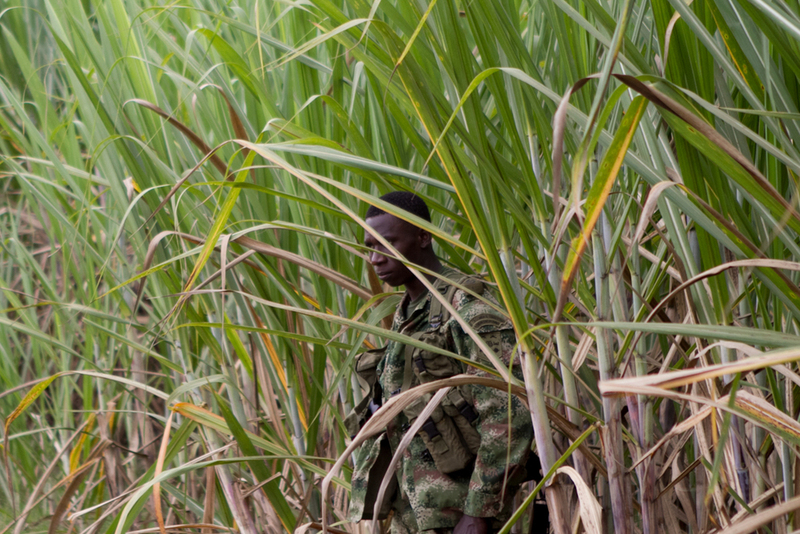 A soldier of the National Army stands guard in one of the roads connecting communities in North Cauca. Cauca, Colombia. 2012. A National Police member stands guard inside a building that was destroyed by combats inside the town. Toribio. Cauca, Colombia. 2012. Children watch the funeral of a man that was killed by gunfire allegedly from the National Army in a protest in the community El Palo, Cauca. Colombia. 2012. Colombian National Army prepares to patrol the mountains where rifle and mortar has been fired by FARC in combats near El Palo, Cauca. Colombia. 2012. Toribio Police Station is heavily guarded, sporadic fir attacks from the mountains by FARC is common. Toribio, Cauca. 2012. A Nasa children is seen in Toribio, where the CRIC (for the acronyms in Spanish for Regional Counsel of Cauca), an organization that encircles a large majority of the Nasa community in Cauca with objectives to continue building the cultural heritage of the Nasas and for imposing indigenous law as granted by the Colombian constitution. Toribio, Cauca. Colombia. 2012. 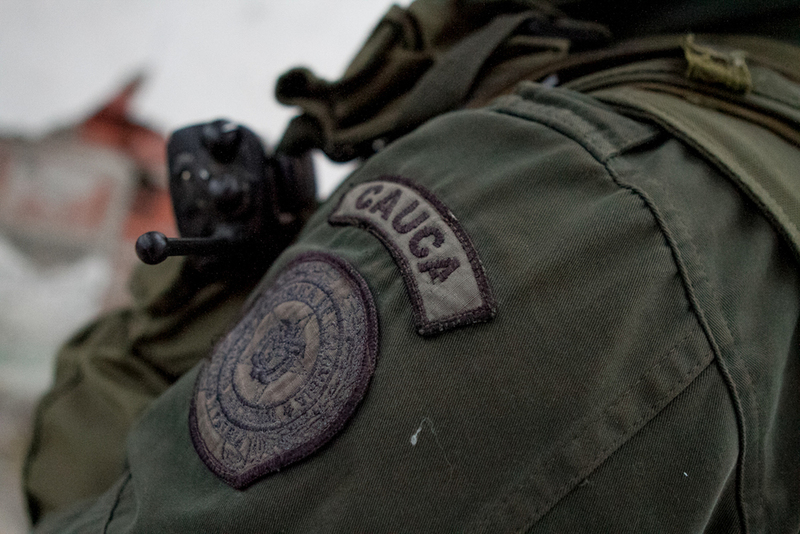 Police shield of Cauca Police Department. National Police outside big cities of Colombia, are armed and trained for guerilla warfare. Toribio, Cauca. 2012.